The Quran Says Jerusalem Is Jewish So Why Won't The Palestinians And Muslim States? The Quran Says Jerusalem Is Jewish So Why Won't The Palestinians And Muslim States? The Quran Says Jerusalem Is Jewish So Why Won’t The Palestinians And Muslim States? 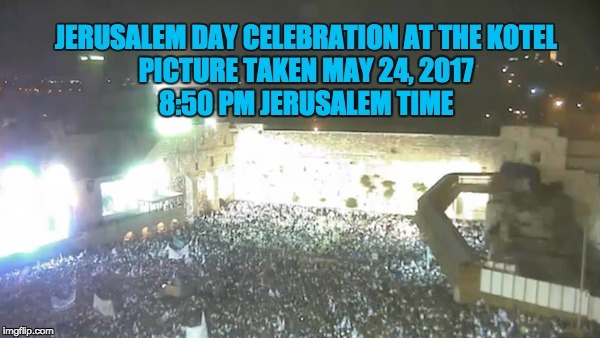 Personal Note: Today is Yom Yerushalayim, Jerusalem Day when supporters of Israel celebrate the day during the 6-Day-War when Israel reunited the holy city of Jerusalem, and for the first time in almost 20 years Jews had access to the holy sites in East Jerusalem. For me the holiday is a split decision. I am ecstatic that Jerusalem is united, but I am saddened that I am celebrating the day here in my home office rather than with the crowd seen above celebrating the day at the Kotel in Jerusalem. According to UNESCO, the Palestinians, and Muslim States Israel and the Jewish People have no right to Jerusalem. It is this fake believe that keeps the U.S. and much of the world from recognizing Jerusalem as the capital of Israel and the Jewish world. The problem is that propaganda ignores that the ancient Greeks, Romans, Christians, and even the ancient Muslims, reported Jerusalem and the Temple Mount were the property of the Jewish people. Let’s start out with the basics. Jerusalem was NEVER part of a Palestinian State, because there was never a an independent state of Palestine. After the Bar Kochba revolt in 135 CE, the Romans punished the Judeans (Jews) for revolting for the second time in sixty years by changing the name of their country from Judea to Syria Palaestina (after the ancient enemy of the Jews, the Philistines who were destroyed a thousand years earlier). At the same time, they changed the name of the holy city from Jerusalem to Aelia Capitolina (literally Capitoline Hill of the House of Aelius). After the Romans threw out many of the Jews, the holy land was ruled by the Byzantine Empire, the Ottoman Empire, and finally the British mandate before it once again became the Jewish State in 1948. Throughout that time all of the holy land including Jerusalem had a very large population of Jews. For the ancient Muslim, Greek and Roman pagan authors, Jerusalem was a Jewish city. Their text indicates the unanimous agreement that Jerusalem was Jewish by virtue of the fact that its inhabitants were Jews, it was founded by Jews, and the Temple located in Jerusalem, was the center of the Jewish religion. And in his account of Titus’ siege of Jerusalem, Tacitus describes the Temple as “… built like a citadel, with walls of its own … the very colonnades made a splendid defense. Within the enclosure is an ever-flowing spring.”[Tacitus, Historiae V:12:1 (Stern, II, XCII, no. 281) 22,30. In addition to physical descriptions, the authors mention the religious aspect of the Temple which differed radically from Greek and Roman paganism. In the text preserved by Diodorus, Hecataeus mentions the priests and their duties in the Temple and even describes a worship service and sacrifice. Similarly, the first century Roman historian Livy remarks that the Jews do not state “to which deity pertains the temple at Jerusalem, nor is any image found there, since they do not think the God partakes of any figure.”Hecataeus, in Diodorus, Aegyptiaca, Bibliotheca Historica XL, 3, 4-6; Stern, I, V, No. 11, 26-28. 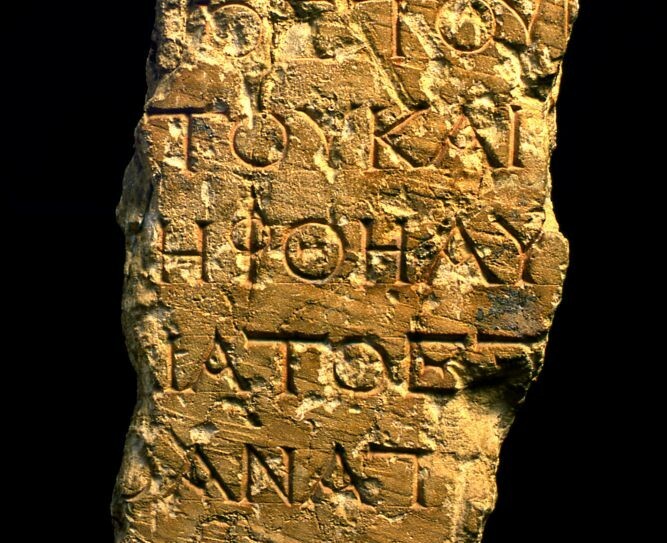 From The Second Temple, warning in Greek delineating a section of the Temple complex which was off-limits to Gentiles. The Palestinians point to the fact that there is little archeological evidence that either Temple existed, which ignores the very convenient fact that there is no digging allowed on the Temple Mount in respect of its holiness to the Muslims. But when the Muslims dug up part of the Temple Mount to add to their Mosque, they dumped the tons of dirt with artifacts outside the holy city. The Jerusalem Islamic Waqf, the institution overseeing the al-Aqsa Mosque compound, carried out excavations on the Temple Mount between 1996 and 1999 as part of the construction of a subterranean mosque in an area known as Solomon’s Stables. Tens of thousands of tons of dirt — roughly 400 truckloads — were excavated by heavy machinery, without the supervision of archaeologists, and were dumped outside the Old City. Archeologists have been sifting through the dirt for years (the project’s called the Temple Mount Sifting Project) , and have found artifacts from the Holy Temples. 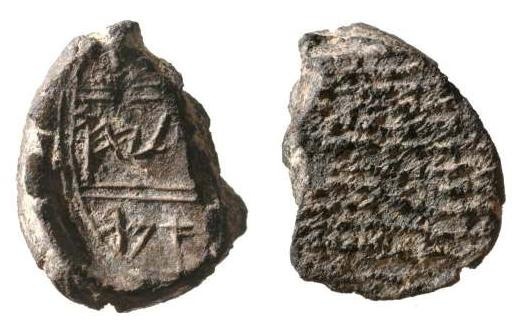 For example in 2005 an archaeologist found what is now known as the Gaalyahu Seal which in Hebrew says belonging to Gaalyahu son of Imer. The house of Imer was a well-known priestly family at the end of the First Temple period, roughly from around the 7th – 6th Centuries BCE. UNESCO is also ignoring references to the Jewish Temple in texts the Muslims consider sacred. The word translated as “Temple” by Abdullah Yusuf Ali (and by the influential translator Marmaduke Pickthall before him) is masjid. This word, which is usually translated as mosque, has the meaning of a sanctuary wherever it appears in a pre-Islamic context. The usual Muslim exegesis of this verse (including that of Abdullah Yusuf Ali) holds that it refers to the destruction of the First and Second Temples. 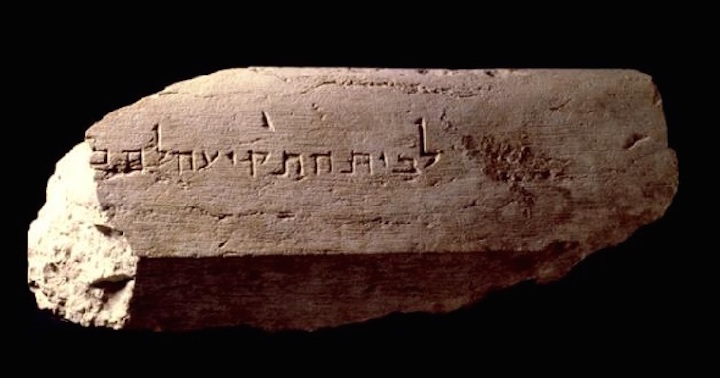 Found By the Southern Wall of the Temple Mount-From Second Temple Inscribed, “To the Place of Trumpeting.” The spot where the Priests blew the Shofar to announce the Beginning and end of the Sabbath and Holidays. When Muslims did build a mosque on this hill, Muslim tradition holds that it was built deliberately on the verified site of earlier sanctuaries. According to Muslim tradition, when the Caliph Umar visited Jerusalem after its conquest, he searched for David’s sanctuary or prayer niche (mihrab Dawud), which is mentioned in the Qur’an (38:21). (David was believed to have chosen the site on which Solomon built.) When Umar was satisfied he had located it, he ordered a place of prayer (musalla) to be established there. This evolved into a mosque-precursor of the later Aksa Mosque. Thus began the Islamization of the complex that later came to be known as the Haram al-Sharif. It became the tradition of Islam that Muslims restored the site to its earlier function as a place of supplication venerated by all the prophets, including Abraham, David and Solomon. The Official 1925 Supreme Moslem Council (Wakf) Guide Book To Al-Ḥaram Al-Sarif, recognized the presence of the Jewish Temples atop the Mount. Shown below is paragraph two which appears on page four, it says, “It’s [the Temple Mount] identity with the site of Solomon’s Temple is beyond dispute.” Now 90 years later the head of the Wakf is disputing it. And let’s not forget that the Jewish Temple is mentioned in the Christian Gospels which pre-date Islam. For example, in Mark 12:40 and Luke 20:47 Jesus accused the Temple authorities of thieving and this time names poor widows as their victims, going on to provide evidence of this in Mark 12:42 and Luke 21:2. Dove sellers were selling doves that were sacrificed by the poor who could not afford grander sacrifices and specifically by women. According to Mark 11:16, Jesus then put an embargo on people carrying any merchandise through the Temple—a sanction that would have disrupted all commerce. In in the Gospel of John 2:15-16 Jesus refers to the Jerusalem Temple as “my Father’s house”, thus, making a claim to being the Son of God. What does this all mean? Ancient text, Muslim text, and Christian text all agree with the Jewish text that there was a holy temple on top Mount Moriah in Jerusalem. So it’s well past time for the American and other world Governments to stop denying Muslim, Christian, and Jewish history, press the BS button on UNESCO and point out the truth. No amount of lies, not from UNESCO, not from the Palestinians, not from any UN committee or any world leader–no one except the Lord God himself, can take Jerusalem away from the Jewish people.